Is the first season of The Four: Battle for Stardom TV show on FOX music to your ears? 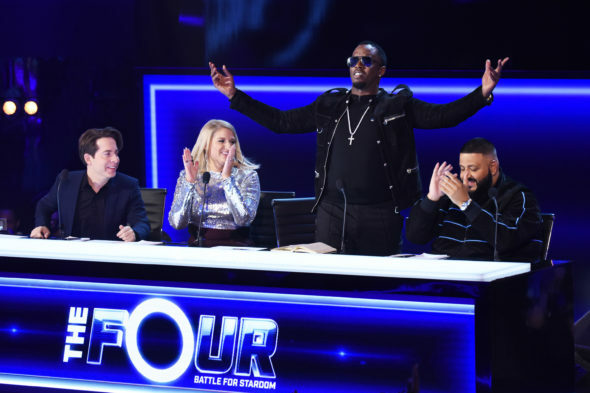 As we all know, the Nielsen ratings typically play a big role in determining whether a TV show like The Four: Battle for Stardom is cancelled or renewed for season two. Unfortunately, most of us do not live in Nielsen households. Because many viewers feel frustration when their viewing habits and opinions aren’t considered, we’d like to offer you the chance to rate all of The Four: Battle for Stardom season one episodes here. A FOX reality TV series singing competition, The Four: Battle for Stardom stars is hosted by solo artist and Black Eyed Peas vocalist, Fergie. The show features singers facing off in hopes of winning a promotional deal with iHeartRadio. Industry pros Sean Combs, DJ Khaled, Meghan Trainor, and Charlie Walk advise the contestants, throughout. In addition to the IHeartRadio promotion, the winner will also benefit by having Combs, Khaled, Trainor, and Walk join their team and guide them toward stardom. What do you think? Which season one episodes of The Four: Battle for Stardom TV series do you rate as wonderful, terrible, or somewhere between? Should FOX cancel or renew The Four: Battle for Stardom for a second season? Don’t forget to vote, and share your thoughts, below. It definitely it not going to hurt the voice ,LOL The judges are goofy acting, and p diddy is making the whole show about what he wants and expects the other judges to vote like he wants. Then why bother to have 4 judges then!! Stupid show…. This show is a joke. I think it’s nothing but a publicity stunt for p diddy. Its how the whole thing is like a game show that makes it ridiculous. This show isn’t that great and judges especially Diddy think that there all that.DJ K sounds goofy as hell.Don’t watch it.